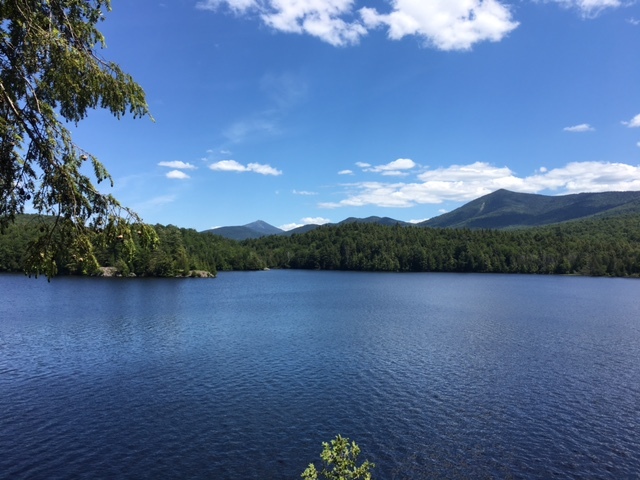 My family and I recently took a trip to the Adirondacks and found a small, out-of-the-way place to hike called Moose Pond. It is entirely on state land, so there were no houses to take away from the wilderness we were in. Everywhere we looked was blue, green or brown – water, sky, grass, trees and dirt. The trail was not marked and not clear. It would go off in different directions. Sometimes they would come back together. Sometimes there were low branches in the way. Or a collection of rocks to maneuver. There had been a lot of rain, so parts were muddy. We would try to balance on rocks and roots to get around the mud patches, but our dog Benny would just plow through. None of this was a big problem because we could figure out how to get back by staying near the pond. Every so often, there would be a clearing so we could take in the vista. Few people were around, so we would mostly be looking out at pristine nature. When we neared the end, we stopped at a lookout to take off our shoes and socks and cool our feet. It was absolutely quiet except for dragonfly interruptions. It made me think that this is what prayer is like. Our life is the trail: unclear, different directions, obstacles, mud. People who care about us walk along with us. Some tread carefully and others barrel through. Some enjoy the scenery while others focus on the task at hand. All of it may seem endless and confusing if it weren’t for the clearings. Clearings are the prayer. They are a chance to check out the vista. A pause, a breath. A time to consider. An opportunity for clarity. Or a course correction. Prayer is getting off the trail, taking a good look around, and remembering there is something greater happening than what is right in front of us. There is a deeper truth, and we are a part of that truth. We just need a clearing to see it. What’s your trail like? Can you find a clearing? In the old comic strip for children – Goofus and Gallant – Gallant was the character to did everything right, always polite and kind. Goofus on the other hand was a disaster of manners and consequences. Each week the strip compared the failed exploits of Goofus and the triumph of Gallant. To understand today’s Gospel, let us understand two more characters. Dour and Hope. Dour bases his life on cynicism. He is content to expect the worse so that he may never be disappointed. He lives a quiet and small life, keeping himself closed off. He applauds himself when things go badly and congratulates himself for knowing it first. Dour does not love, less he be heartbroken; does not befriend less he be betrayed; does not hope, less he be crushed. His greatest prize is smugness. It was over 25 years ago and I had told my friends that I was thinking of entering the seminary when my friend Alissa gave me a book by the German write Ranier Marie Rilke. I was startled by the challenge to think of what you would die for, and then live for it. It is the kind of answer that you cannot think about. It needs to come to you in a flash and my answer surprised me. The Eucharist. Until that moment I had never known just how deeply I have been penetrated by the Eucharist. How Christ’s body and blood had formed me and moved me.